Boy Scout Troop 281 did some clean-up work at Ocean View Historical Society’s Hall’s Store Visitors Center earlier this month. With that in mind, Powell suggested creating an annual fundraiser, to not only raise funds for the society’s many community projects, but also to reach those invested in the area who may not be aware of the society’s good works. Fun & Feasting in the Garden will be held on Friday, June 1, at Good Earth Market, beginning at 6 p.m. The evening will feature a five-course feast created by chef Nino Mancari, a signature “garden mint mojito” drink, wine and beer, and music. The price for tickets is $125 per person. The event is limited to 150 people. The evening is being sponsored by a number of local businesses, including Made By Hand and Heather’s Home Works. Dogfish Head Brewery is donating the beer, while Beach Liquors is contributing the wine, and Good Earth Market is sponsoring dessert. “Dogfish was so excited to hear about our preservation efforts. Jerry Kappes, the owner of Beach Liquors, has been really supportive. They’re donating our wine for the evening,” said Powell. “Heather [DeMarie, the owner of] Heather’s Home Works — she’s really into supporting our community. Susan Ryan has been an advocate for the group since the first day we went and talked to her. She’s sponsoring desserts and leading the way because she’s helped other groups have successful fundraising events at Good Earth Market. It’s a beautiful space there. Powell herself, a local Realtor with Keller Williams, is sponsoring advertising in local papers and through the Bethany-Fenwick Chamber of Commerce. Those who attend the garden party will also have the opportunity to bid on and possibly win some live and silent auction items, including a stay at the Good Earth cottage and a dinner for two, a two-night getaway in a Shenandoah Valley cabin, art and more. “People will like them!” said Psaros of the variety of auction items. Powell said she hopes the event will sell out, so the society can continue its work on the Coastal Towns Museum. With that in mind, the society has restored the 1889 Tunnel-West house, adjacent to John West Park. Along with the Tunnel-West house, the complex features a two-seater outhouse and water pump, the town’s first free-standing post office, circa 1889, a replica of Cecile Steele’s first chicken house, circa 1923, and the Hall’s Store Visitors Center — the newest addition to the society’s buildings. The store will serve as a visitor center, featuring a reproduction of an old-time country store, educational classroom, a galley kitchen and restrooms. Those who drive by the complex may have noticed the completion of the exterior of the building; however, the society is still in need of funds in order to complete the building’s interior. “We have made great progress on our visitor center. 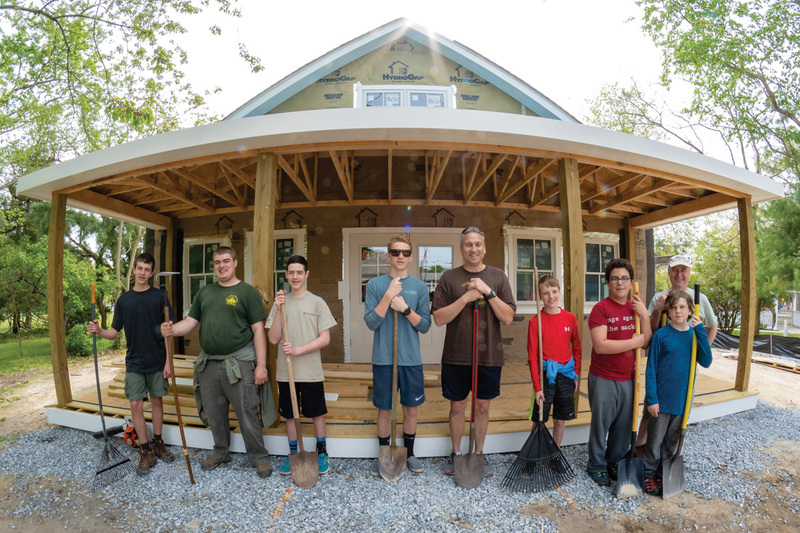 The shingles are on, the doors and windows are in, and by Memorial Day they’ll have done all they can do with the funds we have,” said Psaros. The society also owns the nearby Evans-West house, which is the future home of the Coastal Towns Museum, which the Fun & Feasting in the Garden will be supporting. The home was donated to the society by Carolyn Brunner and her son, Dan McCann, and is on the National Register of Historic Places. The 1901 cross-gabled home also features the original barn and a star-shaped daffodil garden. The society will have their buildings open throughout the summer, every Wednesday from 1 to 3 p.m. with docents available to provide additional information to visitors. That will include the Coastal Towns Museum, even though it is not fully completed. While the museum is not in its completed state, it does feature the original molding, light fixtures and front-door glass etching. “Upstairs, we’re in the process of assembling an old Ocean View loom. They’ll be able to see that, too, if they’re able to go upstairs,” Psaros added. “It’s all in pieces. It’s halfway put together right now. We brought in experts from the Delaware State Archives who were quite helpful. We’re very excited about that artifact. While the Wednesday history days are free and open to the public, donations are always accepted. Along with the Fun & Festing in the Garden event, the historical society will also be hosting its second annual historic homes tour, this year set in Fenwick Island, on Oct. 6. “We need to raise money, and that’s what we’re doing,” said Psaros. Preserving history is important, she said, especially in small coastal areas, whose landscapes have changed dramatically over the centuries. The historical society is always in search of new members to help support their mission, and Powell said she encourages more people to get involved. To purchase tickets to Fun & Feasting in the Garden, visit www.ovhistoricalsociety.org and click on the June 1 date and then click on the green “tickets” button. To reserve a ticket via phone, call (302) 539-2100 during business hours or email info@bethany-fenwick.org.